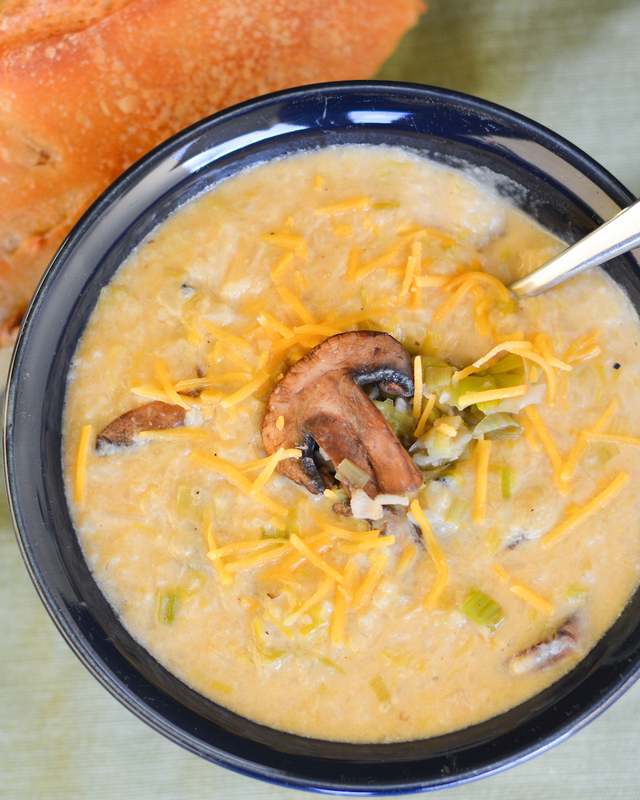 This cheesy Cauliflower Chowder is a warm bowl of comfort food, packed with flavorful mushrooms and creamy leeks. This post is brought to you by Sargento®. The content and opinions expressed below are that of Flying on Jess Fuel. Let’s talk about TV today! Nick and I have very different tastes in TV shows, which makes finding things to watch together a little bit tricky. We like to wind down for the night watching a show in bed, and while we’ve found a couple series that we both enjoy, mostly we do a little clashing over the remote. Nick likes the olden-times and fantasy-type series that are all the rage these days. And I’ll admit it– I like trashy reality TV. Guilty pleasure. And all the home renovation and real estate shows. Slightly less guilty pleasure. There are two types of shows we both enjoy that we usually settle on. Nature shows and competition cooking shows! Totally different, right? But both things that we both enjoy. One of our favorites? Chopped! We’ve been known to waste a few weekend afternoons on Chopped marathons. So I was super excited when I heard that Food Network is having a Chopped at Home Challenge! 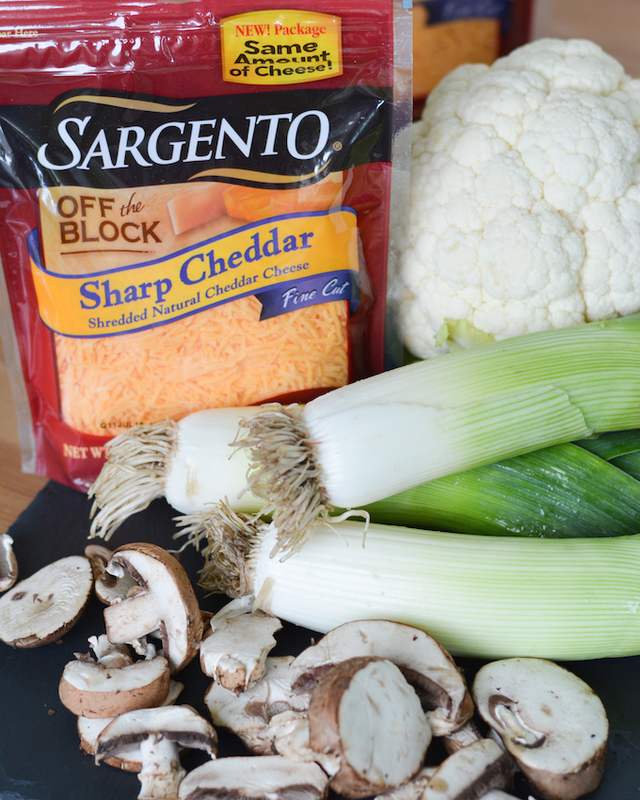 The Chopped at Home Challenge is presented by Sargento. There are 3 rounds of the competition to enter, and for each round the winner receives $5000 and a trip to NYC to compete in the final round. Four finalists will compete in the Food Network studio to win a grand prize of $10,000! The first round of the Chopped at Home Challenge has the theme of “Comfort Food.” My favorite! Ok! I can work with this. Nothing too daunting, right? No strange animal parts. No artificially colored candy. No weird produce I’ve never heard of. Plus, this list includes some of my FAVORITE veggies! When I saw the cauliflower, I immediately thought of this Bacon Cheddar Cauliflower Chowder that I’ve made several times and knew I needed to make a spin off of that. It’s the ultimate comfort food. 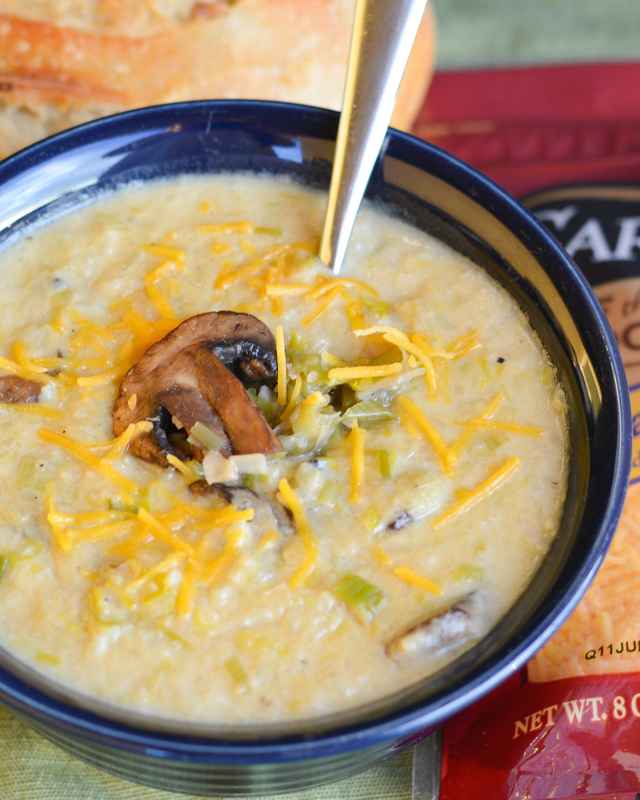 A big bowl of warm, cheesy chowder. Leeks are an amazing food I don’t make nearly often enough. When you saute them down they get so melty and wonderful, and have such an amazing mild onion flavor. I knew they would be perfect for adding flavor to this soup! And the crimini mushrooms (also sold as baby bellas, in case you’re having trouble finding them) are perfect for adding some great texture. Trim root ends off leeks, and remove tough dark green ends. Halve remaining leek pieces lengthwise, then slice (into ¼-inch half moons). Place leeks in a large bowl of water and swish around to remove any dirt from between layers. Drain and set aside. Whisk flour and ½ cup chicken broth together and set aside. Heat oil and butter in a large pot or dutch oven over medium-high heat. Add leeks, mushrooms and garlic, and saute, stirring frequently, until water from mushrooms has evaporated and veggies are soft. Season with salt & pepper, to taste. Add cauliflower and water to the pot and stir. (Note: Shred cauliflower with a food processor or box grater.) Reduce heat to medium low, cover pot and let cauliflower steam about 5-7 minutes, stirring occasionally, until tender. Add remaining chicken broth and milk, turn up heat and bring to a boil. Slowly whisk in flour/chicken broth mixture while stirring, then reduce heat and simmer for 3-4 minutes, until chowder has thickened. Remove from heat and stir in 2 cups of the cheddar cheese until smooth. Taste and adjust salt and pepper, if needed. Serve with extra cheese and crusty bread for dipping! The chowder turned out amazing. It was one of those meals where I couldn’t help but comment on how good it was after every bite. We served it with some crusty roasted garlic bread to dip and the combo was just delicious. 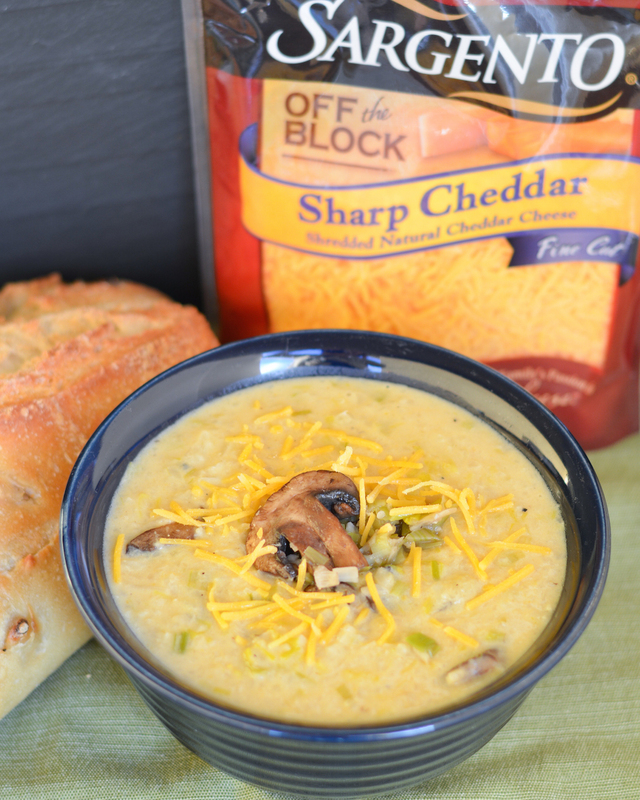 The Sargento cheese was perfectly smooth and gave the soup a wonderful creamy texture. Available in 30 versatile varieties, unique blends and distinct cuts, Sargento Shredded Cheese is always cut from blocks of 100% real, natural cheese. Perfect for adding some flavor to any meal! Are you ready to make some comfort food with the basket ingredients? Check out all the details on entering your own recipe in the Chopped at Home Challenge!